The docked space shuttle Discovery and the Canadian-built Dextre, also known as the Special Purpose Dextrous Manipulator, are featured in this photograph taken by the STS-133 crew aboard the station. The blackness of space and Earth's horizon provide the backdrop for the scene. HOUSTON – Astronauts on the shuttle Discovery will put the final NASA touch on the International Space Station today (March 1) when they add a storage module that will act as a big space closet for the orbiting lab. The module, formally known as the Permanent Multipurpose Module, or PMM, will provide much-needed storage space on the station to warehouse equipment and other spare components. The module, which is named Leonardo and is the size of a small bus, has been packed inside Discovery's cargo bay since the shuttle blasted off last week. The shuttle is delivering the space closet as its final contribution to the massive International Space Station before being retired along with the rest of NASA's shuttle fleet later this year. Discovery's astronaut crew will get an early start to the day, with the robotics operations for the removal of the new closet module from shuttle's payload bay set to begin at 8:08 a.m. EST (1308 GMT). Discovery's current mission is the eighth flight of the now PMM module to the space station. The module made its first flight in 2001. For this flight, engineers have added some extra debris shielding, power systems and other gear to outfit the module for a permanent stay on the space station. Discovery's crew will begin installing the station closet module at 9:48 a.m. EST (1448 GMT) – the job is expected to take about an hour. 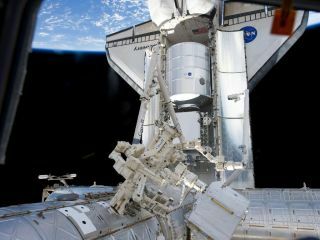 The PMM will be permanently attached to the bottom of the space station on the Earth-facing side of NASA's Unity node. "We're bringing the assembly of the station to a close," shuttle astronaut Mike Barratt told reporters in an in-flight news briefing held yesterday (Feb. 27). "We're bringing the last U.S. module here, so this mission kind of marks a turning point where from now on, we're mostly using the station to get science, and a lot of engineering know-how. So, there's a lot that we're learning up here. It's a really magnificent place." The station's closet module is not arriving at the space station empty-handed. It is packed with about 6,500 pounds (over 2,900 kilograms) of cargo, including a spare treadmill and spare components for the station's thermal control and water management systems. Also tucked away inside the module is a dexterous humanoid robot that will become a permanent resident on the space station. The robot, called Robonaut 2, hitched a ride to the station onboard Discovery and is part of a technology demonstration by NASA and General Motors to assess the potential role of robot assistants on the space station. With the impending retirement of NASA's space shuttle fleet, the station will lose the enormous cargo-carrying capability of the orbiters. The last few shuttle missions are intended to stock up the station as much as possible before the shuttles are grounded. But, a separate problem also exists on the space station, and after 10 years of being continuously inhabited by humans, the laboratory is running out of extra storage space. The extra storage module is expected to help with this problem. Once the module is installed, the astronauts will also be able to use the space to conduct scientific experiments. After the storage room is attached to the station, the module will be pressurized so the astronauts can go inside later today to prepare to unpack its contents. The shuttle and station crew will now have an extra day to transfer cargo to and from the PMM, as Discovery's mission management team decided yesterday (Feb. 28) to extend the STS-133 mission by one day.